Melaleuca L., Mant. Pl. 1: 14 (1767) nom. cons. Myrtoleucodendron Burm. ex Kuntze, Revis. Gen. Pl. 1: 241 (1891), nom. superfl. Cajuputi Adans. ex A.Lyons, Pl. Nam. : 74 (1900), nom. superfl. Kajuputi Rumph. ex Adans., Fam. Pl. 2: 530 (1763), nom. inval. Lamarkea Rchb., Consp. Regn. Veg. : 175 (1828), orth. var. Lamarchea Gaudich., Voy. Uranie: 483 (1830). Melaleucon St.-Lag., Ann. Soc. Bot. Lyon 7: 64 (1880), orth. var. Melanoleuce St.-Lag., Ann. Soc. Bot. Lyon 8: 203 (1881), orth. var. 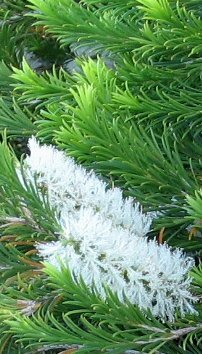 Note: This is the view of Melaleuca based upon a monotypic circumscription of the tribe Melaleuceae - see discussion page and references below. Govaerts, R. et al. 2016. Melaleuca in World Checklist of Selected Plant Families. The Board of Trustees of the Royal Botanic Gardens, Kew. Published on the internet. Accessed: 2016 Apr. 3. Holliday, I. 2004. A field guide to Melaleucas. Reed New Holland Publishers. International Plant Names Index. 2016. Melaleuca. Published online. Accessed Apr. 3 2016. Questa pagina è stata modificata per l'ultima volta il 20 feb 2019 alle 07:35.